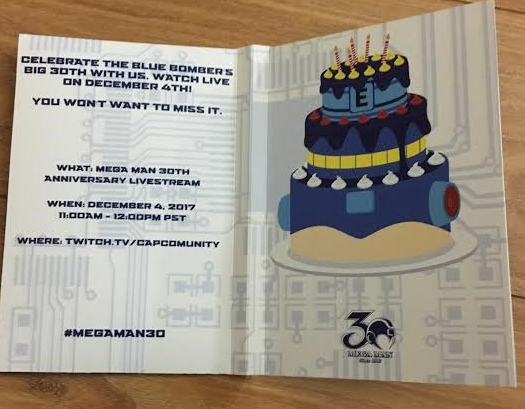 Celebrate the Blue Bomber’s big 30th with us. Watch live on December 4th! "You won't want to miss it" is a pretty bold statement. What, if anything, are they going to announce? Sounds like we won't have to wait too long to find out. I will be hosting the stream on Monday and posting what may (or may not) be announced. For now, remember out mantra: no expectations, no disappointments. more then likely it will be some sort of collection announcement. But on the off chance they do something major. Capcom don't me regret supporting you all these year just for you to remain idiots. Maybe we'll get "lucky" and end up with another "commercial fangame," like Street Fighter x Mega Man. Except, that it's a Street Fighter II-based game with the original eight re-skinned to look like Robot Masters. And, also, Dr. Light is Ryu. Though thinking about it they have been releasing stuff for old games like merch so that maybe a sign.. They're going to announce a buster themed toaster for all your toasted bread needs. If it's anything like the last anniversary panel/stream, I *will* want to miss it. I don't really want to comment with a "it's probably just gonna be a trailer/preview for the new cartoon," but that's what I'm assuming it'll be. I hope I'm way off, of course! Looking forward to the disappointment. Why a Monday of all days? It's like they don't want a big turnout. Sign me up for disappointment. I'm ready, I'm always ready. Anyone else notice that there are 11 dollops of yellow icing on the top layer of the cake? MM11 announcement perhaps...? I'll probably be busy, that day. But, I'm interested in the "news" to come of it, whatever it may be. They'll officially show off the new show & stuff to go along with it like characters & merch. Calling it now, they're announcing the other boot. Until you tell me why I won't want to miss it, I'm gonna miss it. Every now and then Capcom just wants to get as many Megaman fans together in one place before flipping them the collective bird. As a Megaman-loving Switch owner, I am expecting less than nothing. Cool, I guess. I'll try to be optimistic and see what comes of this but I'm also bracing for disappointment. What *would* get me excited is if Capcom either (a) announced a lineup of new games for the ZX and/or X series, or (b) announced that they were selling the IP to IntiCreates so Inti can make some new ZX and/or X games. Is it likely that either of those things will happen? No, but that's what it would take for a Mega Man 30th event to reach "You won't want to miss it" status IMO. Seeing as it's the day before the dlc release for MvC:I... It's probably just a showcase of X and Zero's costumes. Capcom already announced a SF 5 arcade edition stream at the same date. it'll steal mega man's thunder with it. they just can't stop sabotaging the blue bomber, can they? An hour-long stream while most people will be at work or school? Very peculiar choice of time.